Rest awaited him just above in Battir, a village lining a curve of terraced hills a few kilometers southwest of Jerusalem. After drinks and snacks there, he would join his fellow students on a bus back to their home city of Ramallah. “These rural trails are fun, but they’re also enriching our Palestinian identity,” observes Battir café-owner Hassan Muammar, after they’d gone. Earlier, on the opposite, eastern side of Jerusalem, I spent most of a day with the serene crunch of my own bootsteps on a dry trail that echoed down through the canyon of Wadi Qelt. Velvet heat rose in waves. At the end, the palm trees of Jericho appeared through salty lashes like beach umbrellas, stuck into liquid heat-haze on the floor of the desert in the distance below. “Walking like this makes a new connection to Palestine. Your belonging becomes less poetic and more concrete,” says Rosann, a local college graduate. Palestinians have always walked the land. But now walking is changing how many Palestinians feel about the land. It was mainly young men who went on these expeditions. They would take a few provisions and go to the open hills, disappear for the whole day, sometimes for weeks and months. They often didn’t have a particular destination. To go on a sarha was to roam freely, at will, without restraint. Hikers crest a rocky hill between Hebron and Bethlehem along the Masar Ibrahim, which built on the success in the late 1990s of the Nazareth-to-Bethlehem Nativity Trail, “one of the first ideas linked to mass-market tourism” in Palestine, says developer Raed Saadeh. The idea of walking for pleasure survived war and social dislocation. Shehadeh himself led walks in the hills around his home city of Ramallah in the 1980s and 1990s. But since the intensification of Israeli occupation two decades ago, checkpoints, road closures and other impediments have made it difficult for Palestinians to move around the West Bank. Horizons shrank, says tourism entrepreneur George Rishmawi. Many people live their lives in and around their home neighborhoods. Walking in the countryside faded from view. “There are generations that don’t know Palestine,” he says. We have such a beautiful country, but it’s not been utilized before for this kind of [local] tourism. This is an opportunity for people to reconcile their heritage. Beside the physical blocks, there’s also a mental one. Arabic has no word for “hiking.” Different dialects substitute their own circumlocutions, but Palestinian Arabic relies on sarha, which connotes a less purposeful kind of wandering, or shattha, which means an enjoyable outing, such as a picnic. Neither really fits, and an idea without a name is always hard to grasp. Rishmawi was involved in the first of Palestine’s initiatives to reintroduce long-distance walking for pleasure. In the late 1990s, as part of the un-backed “Bethlehem 2000,” the Palestinian government sponsored the creation of the Nativity Trail. 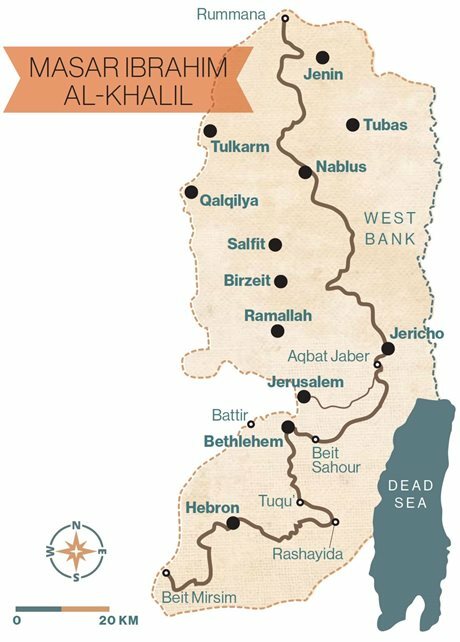 Developed by tour operators Alternative Tourism Group and Siraj Center, this trail forms a 160-kilometer walking route from Nazareth south to Bethlehem that roughly follows the journey taken by expectant parents Mary and Joseph before Jesus’s birth. At that time Palestinian walkers didn’t really feature in the equation. “The idea was to attract foreign tourists,” says tour operator and walking guide Mark Khano. At Khano’s invitation in 2000, two British explorers, Tony Howard and Di Taylor, walked the Nativity Trail and published a pioneering English-language guidebook. 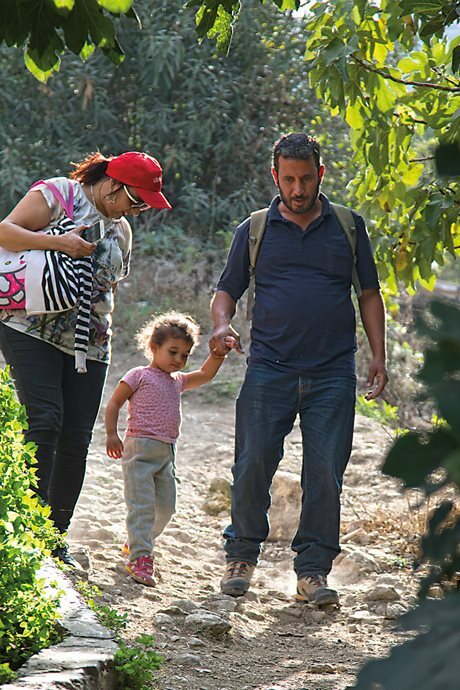 In Battir, Sabrina Zaben is out for a country walk with her partner, Ahmed Abu Haniya, and one of her two children. “When I have a chance, I like to walk here. It’s easier than before. By following social media, there are lots of hiking groups online,” she says. “Palestine wanted products, and the Nativity Trail was one of the first ideas linked to mass-market tourism,” says Raed Saadeh, a leader in sustainable tourism development. A sunny fall morning in Bethlehem sees municipal workers clearing leaves in Manger Square, the main public space. On the edge of a small group of fit-looking Europeans and Americans kitted out for hiking, two middle-aged Palestinian men are getting acquainted. Silver-stubbled Yusuf Salah, with a few belongings clutched in a plastic bag, says he’s done a bit of walking before, but never this route. His new-found trail buddy, Hani Abu Taih, smiling under a straw hat, concurs. Slightly removed by language and appearance from their fellow hikers—some of whom are tourists, some resident expatriates—the two pals psych themselves up for the day ahead walking the Masar Ibrahim, now the best known of Palestine’s long-distance hiking trails. Masar is the Arabic word for path, and Ibrahim is Arabic for Abraham, the founder of Judaism, Christianity and Islam: The name translates into English as Abraham’s Path. “Twenty years I’ve been walking—one or two hours every morning, but just around my village near Nazareth, and always alone. 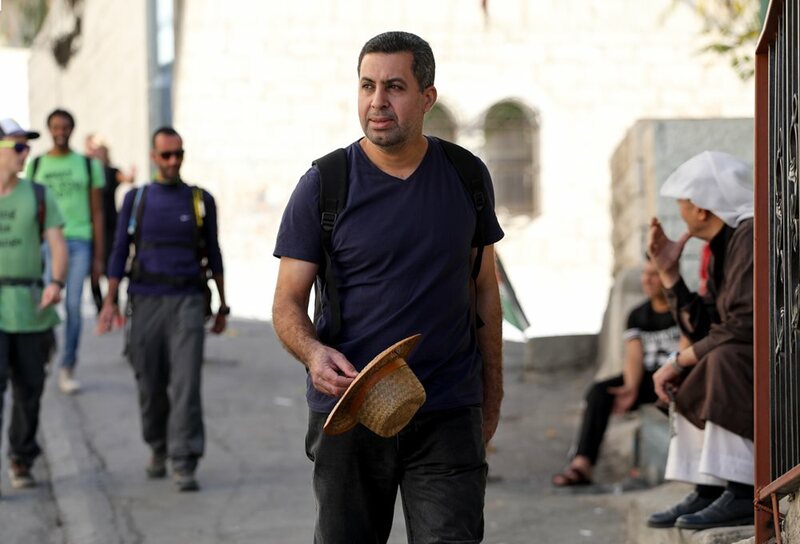 I want to try walking with a group,” says Hani Abu Taih as he sets out on the Masar Ibrahim from Bethlehem’s Manger Square. Unlike the region’s numerous and ancient pilgrimage routes, the Abraham Path is a modern creation, devised in 2006 by a group from Harvard Law School in the us headed by William Ury, a specialist in negotiation strategy. Ury’s idea was to help fuel cross-cultural understanding among the peoples of the Middle East—and bring transformational socio-economic benefits—through the power of the simple act of walking. As he puts it, walking creates space for people to envision fresh solutions to long-standing challenges. Abraham is said to have walked with his family all across the Middle East from Ur, his place of birth (often identified with Ur in Iraq, but also linked with Urfa in southern Turkey), through Syria and Jordan to Palestine, where his tomb is honored today at a mosque in the city of Hebron. Further traditions place Abraham—known as al-Khalil (the Friend), for his embodiment of loyalty and hospitality—in Egypt and Saudi Arabia. a thru-hike route began to emerge. There is no documented historical evidence for Abraham’s existence 4,000 years ago, or for the routes he might have followed. No pre-existing path links these places. All we have are stories. After listening to local people, however, researchers with Ury’s nonprofit Abraham Path Initiative (api) were able to begin mapping a constellation of traditions, folk memories, tales and legends that suffuse the multiethnic cultures of the Middle East. A trending line began to emerge, connoting linkages in a shared Abrahamic heritage. From that a physical walking route could be plotted. For most of the last decade, api has painstakingly built local capacity along sections of that route through a loosely affiliated network of trekking scouts, community-outreach volunteers and partner organizations on the ground. Today, as api steps back from trail development toward a quieter role in funding, ownership of the route’s active sections has passed fully to local partners. 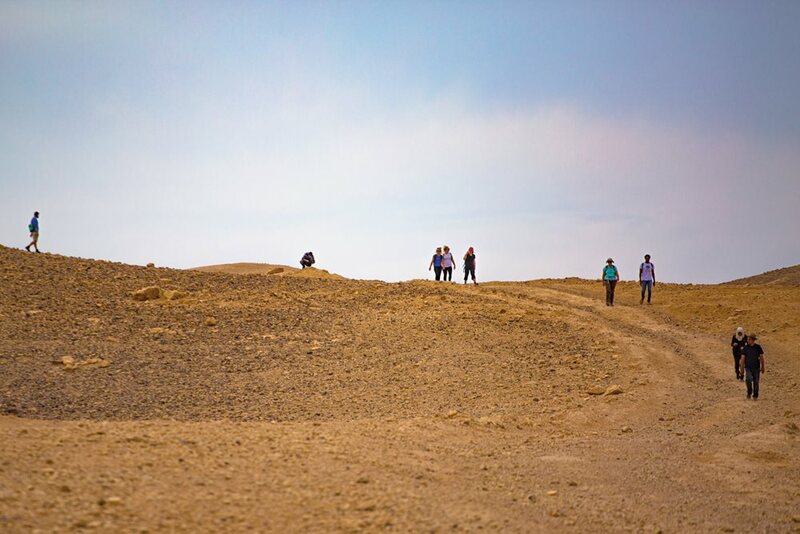 On a clifftop overlooking the Dead Sea, guide George Giacaman chats with Danish hikers Laura Bendix Pedersen, Nina Timm Ifversen and Julie Nielsen. In Jordan, for example, guides, tourism professionals and community activists built on the Abraham Path’s early growth in one remote highland region to develop a full-blown national hiking project. The result was the Jordan Trail, launched in 2017 as 36 day-hikes that link together to form a six-week, 650-kilometer trekking route from one end of the country to the other. Elsewhere, southern Turkey had 170 kilometers of Abraham Path trail open by 2012, though war in Syria cut further progress short. Specialists are currently working with api to explore trail development in Saudi Arabia. In Egypt, three Bedouin tribes, backed by ngos and local volunteers, in 2015 launched the 250-kilometer Sinai Trail, which links the Red Sea coast with the summit of Egypt’s highest peak, Mt. Katherina. 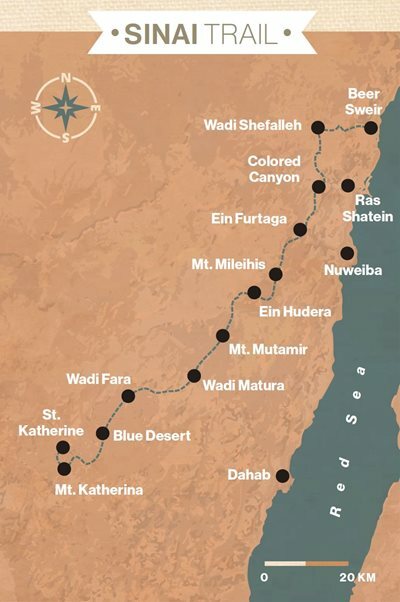 Support is shared: Partners of the Sinai Trail, beside the Jordan Trail Association, include Masar Ibrahim al Khalil, the Palestinian ngo that has developed api’s route in the West Bank. 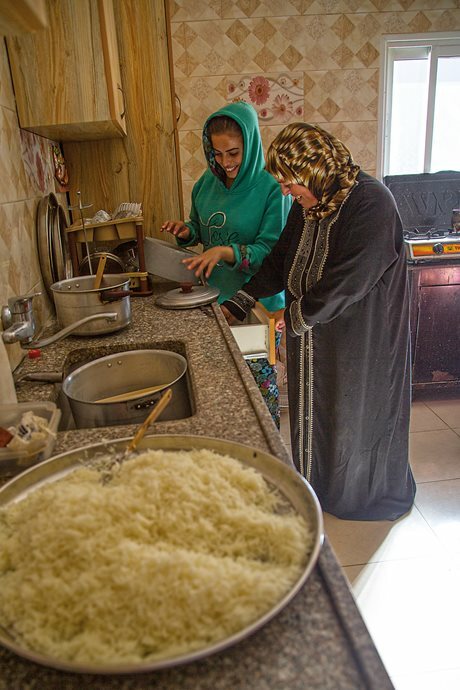 In the village of Tuqu’, Um Naseem and her daughter Sajida prepare a meal for hikers. That route begins at Rummana, at the northernmost limit of the West Bank near Jenin. It winds south, through the cities of Nablus, Jericho and Bethlehem, to end among the villages south of Hebron: 330 kilometers in total, divided into 21 day-hike stages. It deliberately zigzags, binding otherwise marginalized rural communities into what has become a national trail. It has also drawn substantial international funding: In 2014 the World Bank gave the project $2.3 million over four years. The French agency for international development, afd, provided €1.4 million ($1.7m) in 2016, and French ngos and private-sector bodies continue further support. This has paid for trail development, waymarking, training for guides, ancillary support along the trail such as homestays and guest houses, a staff of 10 at offices near Bethlehem, and a subsidized public program of weekly walks. High-quality digital cartography by us trail developers David Landis and Anna Dintaman forms the basis of a detailed website. Local and online marketing gets the word out. Such open access to the trail, however, means assessing success is difficult. Rishmawi, who serves as executive director of the Masar Ibrahim ngo, explains that by using data from partners, guides and guest-house owners, he can estimate that last year, 6,000 people walked on the path. Between a half and three-quarters of them were Palestinian—some individuals, but mainly organized groups that included students and youth associations. Rishmawi speaks passionately about the value of creating new reasons for Palestinians to visit the countryside. The women’s group in Jericho’s Aqbat Jaber refugee camp converted a traditional, mud-built kindergarten into a guest house to accommodate hikers. “We have such a beautiful country, but it’s not been utilized before for this kind of [local] tourism. This is an opportunity for people to reconcile their heritage,” he says. One of Masar Ibrahim’s founding partners is the Rozana Association, set up to help overcome rural problems of economic disadvantage and loss of community. Headquartered in the pastoral university town of Birzeit, a tight tangle of cobbled lanes in the hills north of Ramallah, Rozana has facilitated architectural restoration in Birzeit itself, including converting an Ottoman mansion into a science center that draws school groups and establishing an annual cultural festival that now brings 35,000 visitors to this town of around 7,000 residents. “The question was, how to strengthen this attractiveness? You need to have tourism demand, especially local,” says Saadeh, founder of Rozana. The resulting web of generally unmarked footpaths connect to centuries-old monuments to Muslim mystics, known as Sufis. Many such sites dot the hills of the northern West Bank, and today they often stand half-forgotten. “Walking helps protect this type of heritage,” Saadeh says, explaining that Rozana sources funding both for preservation of the buildings and conversion of the surrounding areas into small community parks. “They’re spiritual, sentimental places that tell stories. They become an attraction,” he says. Rozana’s principle of clustering also avoids imposing a new system of external management by combining the abilities of pre-existing community organizations. In the highland village of Deir Ghassaneh, one of Rozana’s rural hubs, the head of the local women’s association, Insaf Shuoibi, speaks of the economic benefits that have accrued by joining forces with a neighboring village to work on their local trails. “Five years ago it was mostly foreigners visiting, but now the word is spreading, so we have more Palestinians,” she says. Another of Masar Ibrahim’s founding partners is nonprofit tour operator Siraj Center. For Siraj’s ebullient director Michel Awad, the last few years have seen an astonishing shift. “People never thought of walking as a journey. It was just a way to get from point A to point B,” he says. Ramallah-based mountain guide Wael Haj runs Palterhal, a firm offering rural hikes and eco-retreats for companies. 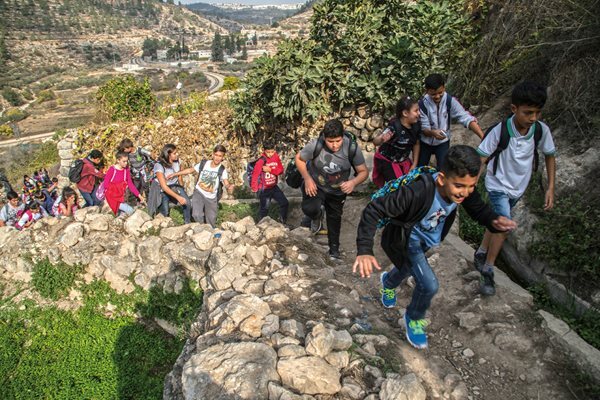 After chatting in Bethlehem’s morning sunshine, the hikers in the Masar Ibrahim group that includes Yusuf Salah and Hani Abu Taih take their first steps, down the steep streets leading out of Manger Square. Their route soon leaves the city behind, passing a spring in the hills before winding through a fertile valley to end almost five hours later in the village of Tuqu’. There, householder and construction worker Salim Saba greets the walkers, bustling them through the narrow hallway of his house and out to a shaded rear balcony where glasses of cold juice and sweet tea await. Near Battir the trail winds through olive groves. “The walk was better than I was expecting,” grins Abu Taih, looking across to the 2,000-year-old hilltop fortress Herodium just beyond Tuqu’. He shows me the guest rooms he has fitted out with help from the Masar Ibrahim ngo, which split its cost with him. The ngo will retain ownership for five years, after which the beds (and their neatly branded covers) become his. Then he takes me through to the half-built extra rooms he is adding to the house to accommodate the increasing numbers of walkers passing through. The group’s Palestinian guide is George Giacaman. Wiry, pencil-thin in Lycra, he explains that he just came from leading a group of 35 Norwegians on an 11-day Nativity Trail trek, and that he is proud to be involved. “The Masar Ibrahim is especially helping women in the villages, who work at home. They make food for people walking through, or products to sell,” he says. This is a familiar model for sustainable development: Relatively small amounts of external funding spur creative input from local minds building trust and skills that help open new markets, bringing new consumers into direct contact with rural suppliers. Dutch economist Stefan Szepesi was another of those who grasped the potential early on. He arrived in Palestine in 2006 to work on governmental projects with the European Union. But he had itchy feet. “I first started walking out of curiosity. What was Palestine like beyond the confined view of a diplomatic car?” he writes. Eventually, the walking took over. Szepesi switched jobs to become executive director of api to work with the Masar Ibrahim ngo and others. He also published a thick, full-color guidebook of walks around the West Bank. But, as he readily acknowledges, English-language books have limited local readerships, and foreign tourism is simply not big enough in Palestine to deliver sustainable economic growth. Enter social media: Over the past decade, it has brought walking into the Palestinian mainstream. Outdoor enthusiasts have created dozens, maybe hundreds, of online and email groups where like-minded people can share information on routes and publicize excursions and weekend hikes. Szepesi’s Facebook group “Walking Palestine” was one of the first, alongside others created by students in Ramallah, Nablus, and elsewhere. Szepesi has stepped back from active involvement, he says, but “Walking Palestine” continues with almost 5,000 members. “Walking didn’t happen until it became formalized, thanks partly to the work of Stefan Szepesi,” says Ihab Jabari, director of the Holy Land Incoming Tour Operators’ Association. 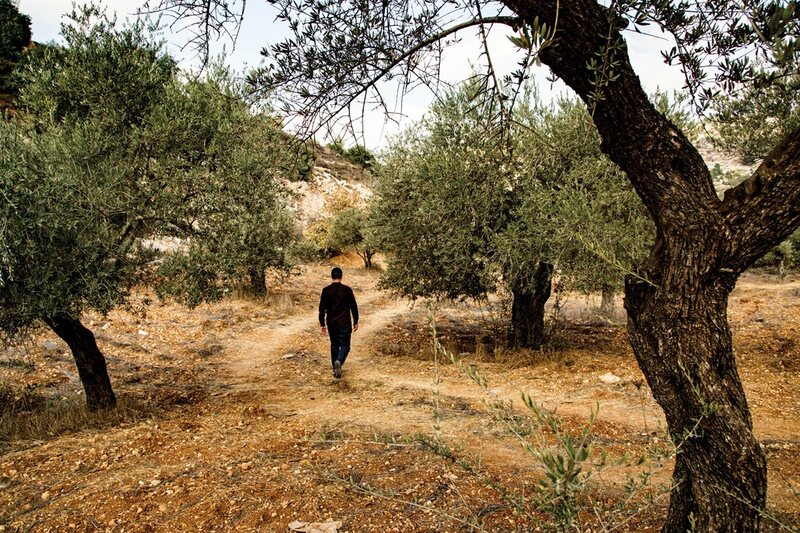 Seeing shared images posted by local walkers out in the countryside, and hearing their first-hand accounts, has brought a fresh sense of scale, immediacy and possibility, says Walking Palestine’s current moderator, Simon Jaser. “It’s the 35-to-55 demographic who are really into walking. These are professional people,” he says. Sharing tea at one of Ramallah’s busy sidewalk cafés, Jaser tells me he has covered most of the West Bank on foot. Besides working part-time as a consular official, Jaser is a successful independent guide who also channels some of his profits back into rural communities; he also offers his services for free. Each weekend he advertises a walk via Walking Palestine, which can draw as many as 120 people. One of his regulars is Issa Abu Dayeh, 74. “Last Friday we were around 100 people, ladies and young men—I’m the only old one!” says Abu Dayeh. Jaser is clear about his motivation. “I want Palestinians to walk throughout the land, and not just a kilometer or two outside their city,” he says. I see the relationship between these people and the land deepen while they’re here. A striated wilderness of canyons and scree slopes reaches out near Rashayida village, southeast of Bethlehem. This patch of highland desert—a rarity for Palestine—leads out to cliffs that gaze east directly into a breathtaking sunrise over the Dead Sea. It’s gaining renown as a weekend getaway. “Lots of people go onto my Facebook page asking about these landscapes. ‘Can we really go there?’ ‘Do we need a permit?’ ‘Is it safe?’ These are Palestinians from Hebron or Nablus: They have no idea such places even exist in Palestine,” says Farhan Ali Rashaydeh, a guide from the local Bedouin community. The impact of online networking is being felt everywhere. In Battir, Sabrina Zaben was out for a country walk with her partner, Ahmed Abu Haniya, and two children. “When I have a chance, I like to walk here. It’s easier than before, by following social media. There are lots of hiking groups online,” she explains. “Social media lets people come together and plan something. It’s becoming much simpler,” says hiker Joudeh Abu Saad, resting outside Bethlehem with friends after a day’s walk. For tour operator Mark Khano, the last few years have seen a happy coming-together of influences. For Ghaida Rahil, program manager at Masar Ibrahim, networking on Facebook led her to set up the Palestinian Women Hikers Club, a group of around 30 women who meet once a month to spend a day on the trail. “We need to teach women to take care of themselves. Women don’t have the same chances as men to go outside, but why should we only see the people around us? No, we should go out and experience other places and other people,” she says. This all makes the trails more than simple footpaths. The Masar Ibrahim, the Nativity Trail, the Sufi Trails and the informal path networks in Battir and elsewhere all exemplify a bottom-up, community-led model of both cultural and economic inclusivity. They become platforms for a form of national reconciliation, linking far-flung communities together in a shared experience of outdoors. That sharing extends to the most deprived. On the edge of Jericho, the Masar Ibrahim diverts into Aqbat Jaber refugee camp, a low-income neighborhood where in 2014 the local women’s association converted a traditional mud-built kindergarten into a guest house. “It was an idea from Masar Ibrahim, to let people passing through from Wadi Qelt stay here,” says association director Jamila Abul-Assal. From cliffs above the Dead Sea, hikers look out over Jordan at sunrise. 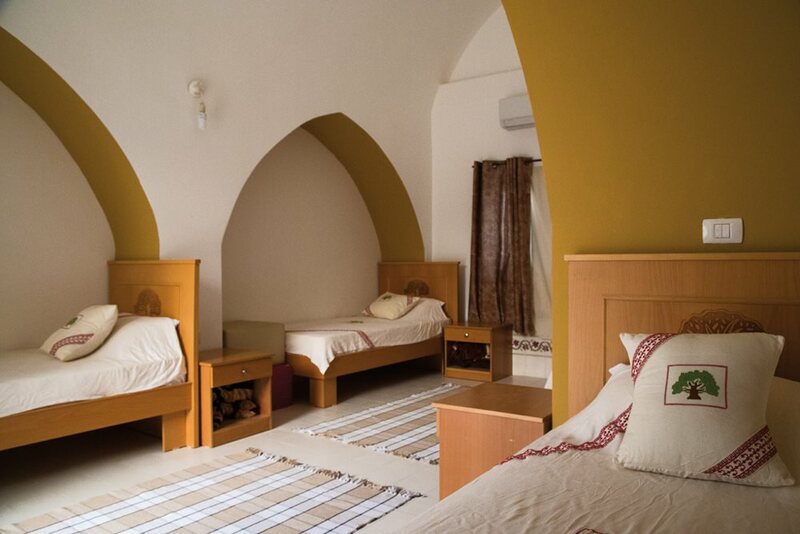 The ngo split conversion costs with the community, which now has a marketable resource: The Mud House is the only lodging of its type in Palestine, and it draws outsiders looking for experiences they can’t get anywhere else. “We know more people, we have more relationships, life has changed a lot. Aqbat Jaber is now on a par with other communities because of Masar Ibrahim,” says Abul-Assal. It’s a similar story at Rashayida, where Bedouin patriarch Mohammed Ali Rashaydeh, known as Abu Ismail, has carved out a business catering to walkers and weekenders seeking desert solitude. 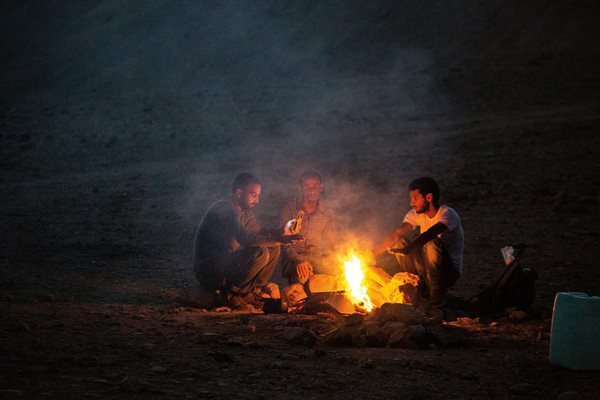 At nightfall, Farhan Ali Rashaydeh and other Bedouin guides on the Masar Ibrahim tend a campfire. That meeting led to an offer of partnership with Masar Ibrahim. Under the ngo’s shared costs approach, Abu Ismail built a sleeping block and toilets, and he brought in beds and bedding. Now his tent is an overnight stop on the national trail. “Life feels very different now,” he says with a hawk’s frown, and eyes to match. After lunch in Tuqu’, Yusuf Salah returns home to Bethlehem, but Hani Abu Taih presses on, crossing the desert with Giacaman, his guide, and the group for a night of campfire conversation—and that amazing Dead Sea sunrise—with Abu Ismail. As we stand by the tent flap after breakfast slurping a glass of hot, sweet tea, I ask Giacaman if he ever gets tired of walking. With a shout, he gathers his group, shoulders his pack, and hits the trail, destination Hebron, two days away. Built by guides from three Bedouin tribes with backing from ngos and help from local volunteers, the 250-kilometer, sea-to-summit Sinai Trail offers hikers a new way to experience the southern Sinai Peninsula. To residents it offers a path to rejuvenate an ailing economy. 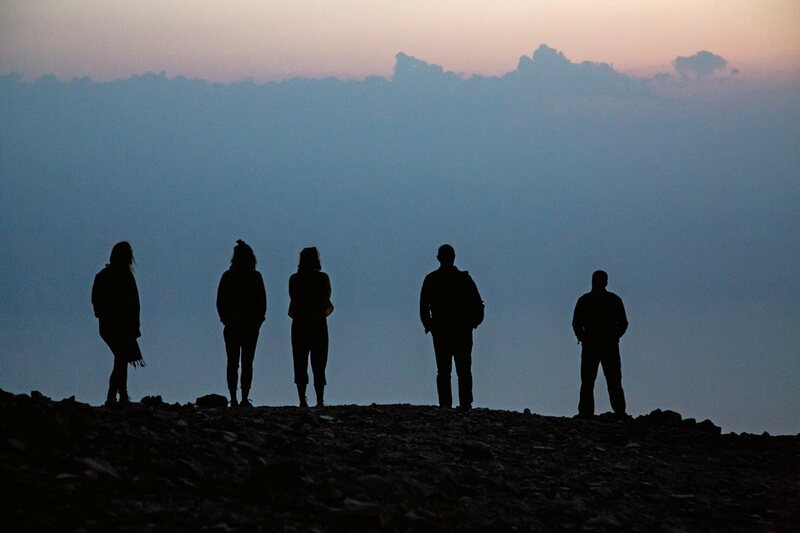 From an isolated spot in the heart of the Sinai Peninsula, a small group of hikers are watching the sunset. Their faces, chapped by sunshine and icy wind, turn toward north Africa; behind them are Saudi Arabia’s Hijaz mountains. From the 2,626-meter-high peak of Mt. Katherina, their view is obscured only by clouds. It’s December, and the group has just become the first international team to complete the Sinai Trail, a 250-kilometer route across the coast, desert and mountains of Egypt’s neglected peninsula. Established in 2016 by local activists and guides, it’s a bid to revive a tourist economy left reeling by years of instability. Organizers hope the fully mapped path, the country’s first long-distance hiking trail, will bring back international visitors who once flocked to Sinai. “After the revolution there were lots of problems,” Nasser Mansour, a guide and founding member of the Sinai Trail, explains as he picks his way down a mountain path only he can see. Like many guides here, Mansour made a good living from tourism before 2011, when he estimates the Sinai’s sweeping deserts, scraggy high mountains and coral-rich seas attracted around 5,000 visitors a year. Now he guesses that’s dropped to a few hundred. In recent years the troubles—illuminated by the 2015 bombing of a flight from Sharm El Sheikh and an ongoing insurgency in northern Sinai—have continued. While the decline has been devastating for the community, the Sinai Trail is their way of fighting back. Mansour and a small team have been working for nearly three years to create the trail, walking hundreds of kilometers to map out a previously uncharted route; training young Bedouin to become qual-ified guides; and building a publicity campaign including a slick website. And Mansour believes it’s paying off: “The people now feel they trust to come. They see the Sinai Trail and all these things, and they trust,” he says. The trust is essential to the success of the project, and it exists because the Bedouin here truly have a stake in the project. Msallem Faraj, Mansour’s colleague, compares the Sinai Trail to luxury hotels that now stand empty along the coast: It allows local people to genuinely take control of their own environment. 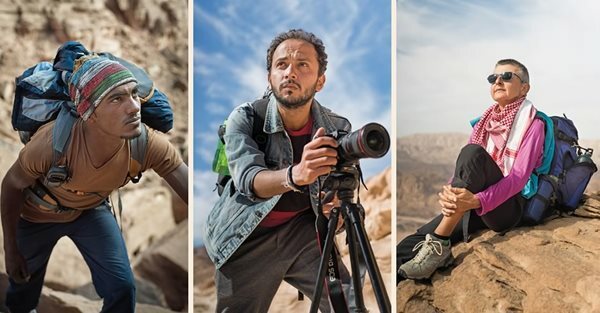 Trailblazers on the first international thru-hike of the Sinai Trail included, top right, trail guide Nasser Mansour, one of the Jebeleya tribe’s top representatives to the Sinai Trail Bedouin cooperative and an expert on the region’s plants and animals; top center, Nada el Shazly, who handles social media accounts for the trail organization; center, organizer and trail ambassador Ben Hoffler;lower, left to right: Mohammad Al Zaeadeen, who helped develop the Jordan Trail; Karim Abada, who produced a video documentary; and Cristina Gheza, who also leads diving expeditions in the region. The first group that sat atop Mt. Katherina has been followed by others. 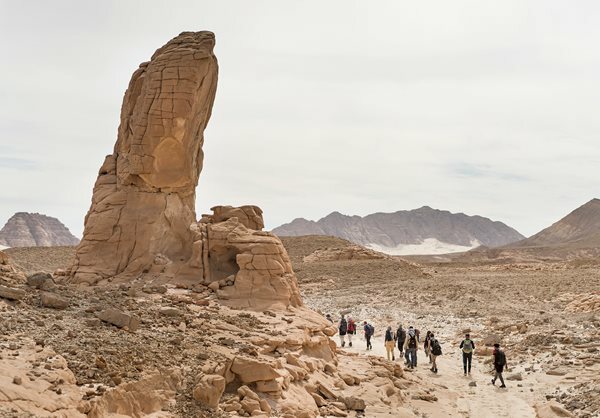 A mix of outdoor enthusiasts, first-time hikers, Egyptians and international visitors, many are now enthusiastic supporters of the Sinai project, volunteering to coordinate trips from Cairo or spreading the word online. The message that Sinai is not a war-torn province but a destination with stunning natural beauty and rich culture can be difficult to broadcast over the clamor of conflict, but it’s slowly making a difference. On May 13, 2017, a small group of exhausted yet exhilarated hikers leaped into the clear, warm waters of the Red Sea in Jordan’s Gulf of Aqaba. This aquatic celebration was the climax of a six-week, 650-kilometer hike from Um Qais in the north of the country to Aqaba in the south, and the culmination of the inaugural thru-hike of the new Jordan Trail. Along the way, the group had hiked through some of the most spectacular landscapes in Jordan, passing through 52 villages and staying with over 60 host families. Joining the thru-hike were veteran British mountaineers Tony Howard and Di Taylor, who have been exploring the climbing and walking routes of Jordan for the past 30 years, and whose idea this ambitious new trail was. Compiling a guide to trekking in Jordan in the 1990s they realised they could link many of the paths to form a trail spanning the length of the kingdom, creating the world’s only long-distance path to cross an entire country end-to-end. It took another 20 years before their project was taken up by Jordanian tourist organisations, and in 2015 the Jordan Trail Association (jta) was formed. The upshot is that the Jordan Trail is a collective effort, serving community and country alike. Local families who accommodate hikers and the Bedouin employed as guides will benefit, as will Jordanian tourism, whose international profile as an adventure destination has been raised by the enterprise. Amongst the merits of the trail is its flexibility. Hikers can walk independently using downloadable maps and GPS, hire local guides or join one of the organised group hikes that take place throughout the year. They can trek for a day, for a weekend, or complete the whole route either in stages or in one go. The jta website provides the route maps, plus contact information for local suppliers—the guides, the hosts, the drivers—who support hikers through the trail. To make the route more manageable the trail is divided into eight stages, beginning in the fertile terrain of olives, orchards and forests in the north, with its Roman and Byzantine ruins and hilltop castles. South of Amman it traverses three spectacular Dead Sea wadis before entering the Dana Nature Reserve from where hikers continue to Petra, arriving at the great Nabatean city via a quiet side canyon. The final stretch of the trail passes through the dramatic deserts and mountains of Wadi Rum ending, as the inaugural thru-hike did, in the clear, warm waters of the Gulf of Aqaba.